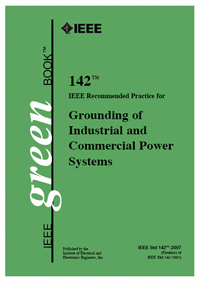 The IEEE Green Book reviews practices and methods of system grounding in detail. A thorough investigation of grounding problems, and the methods for solving these problems, is presented. In presenting these problems and solutions to electrical engineers worldwide, the IEEE Green Book provides a basic framework for applying fundamental principles to specific work situations and applications. The IEEE Green Book addresses many different aspects of grounding. The problems of system grounding, which include connection to ground of neutral, of the corner of the delta, or of the midtap of one phase, are covered. The advantages and disadvantages of grounded versus ungrounded systems are discussed. Information is given on how to ground the system, where the system should be grounded, and how to select equipment for the grounding of neutral circuits. Methods for connecting the frames and enclosures of electrical equipment to the ground system are addressed. The fundamentals of making the interconnection between the electrical equipment and ground rods, water pipes, etc. are outlined. Even problems relating to static electricity and lightning, as well as sensitive electronic equipment, are covered in the IEEE Green Book.